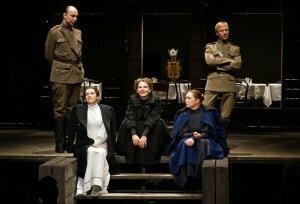 Following a critically acclaimed West End Season at the Theatre Royal Haymarket last year, with celebrated productions of Uncle Vanya and Life & Fate (Critics’ Choice The Guardian, Financial Times, Telegraph, Sunday Times) the Maly Drama Theatre of St. Petersburg return with a luminous retelling of Chekhov’s masterpiece, Three Sisters. Playing in London for 10 performances only from June 19th at the Vaudeville Theatre, press nights will be held on June 19th and 20th. Rediscover the tragicomic story of the Prozorov sisters as they contend with their disillusioned lives in provincial Russia. Renowned director Lev Dodin directs this radiant, complex play with rich insight into Chekhov’s eloquent understanding of passion, resignation, longing, and love. Under the artistic directorship of Lev Dodin – one of the most celebrated theatre practitioners working today – the Maly Drama Theatre of St. Petersburg has become one of the greatest theatres in the world. During his 35-year tenure many of Dodin’s shows have won international awards including state prizes of Russian and the USSR, Golden Mask Awards and a Lawrence Olivier Award (becoming the first international company to do so for Stars in the Morning Sky, 1989). In 2000 he received the European Theatre Award. Of Three Sisters, Dodin comments: “Checkov speaks with passion and eloquence about the hopelessness of our life, about the tragic discrepancies between our yearnings and reality, about the vital importance of staying true to oneself and preserving your dignity.